Fencing is the art of attack and defense using a lightweight sword. It is a graceful, fast-moving, exciting sport, and a great workout for both body and mind. It develops agility, concentration, speed, and timing. 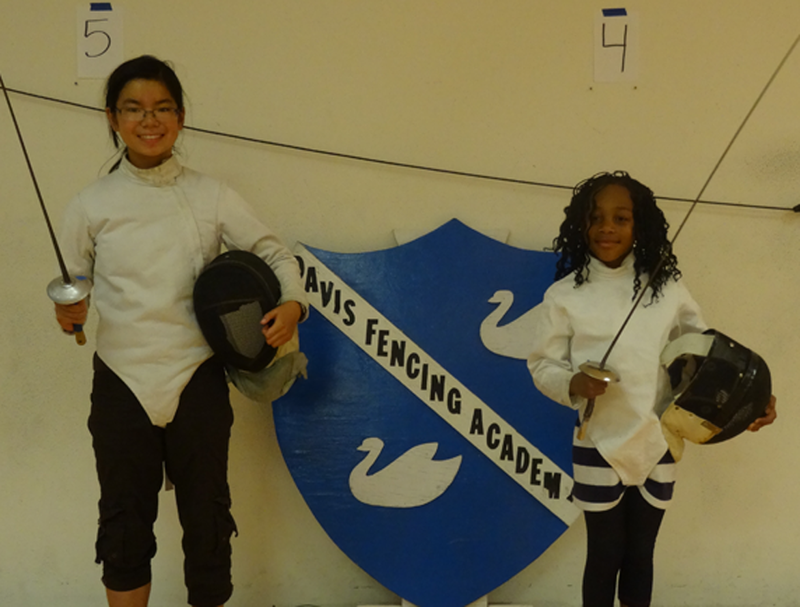 Men, women, and children of all ages and levels of fitness enjoy fencing. Most importantly, fencing is safe and fun. Come in at the beginning of the month in loose clothing and comfortable shoes. 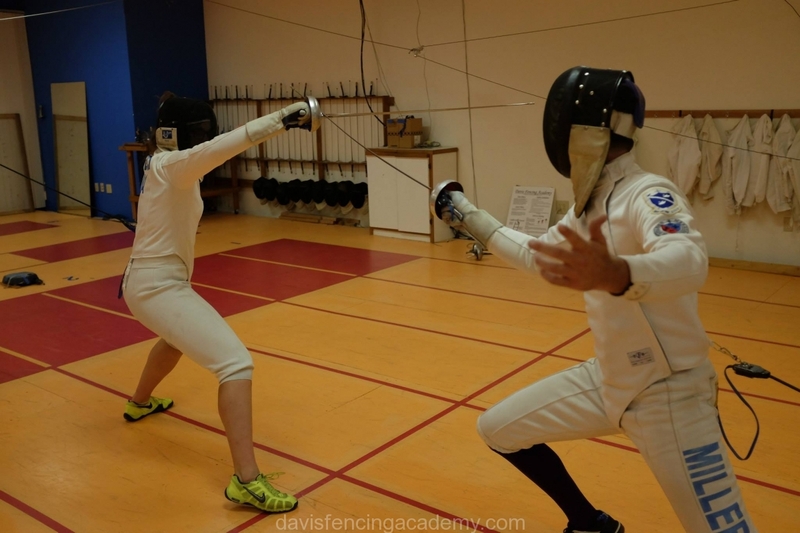 The beginners class introduces students to the basics of footwork, bladework, and concepts in fencing. 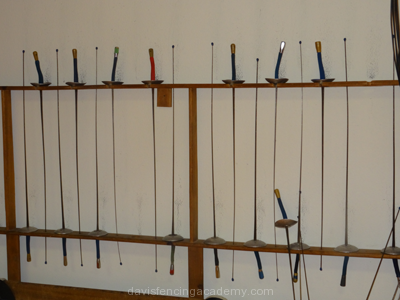 This will help to a foundation of technique, terminology, and history in preparation for intermediate levels of fencing. Instruction is given one hour twice a week beginning in the first week of the month. After completion of the four week (one month) program the student is allowed to graduate to the intermediate level. USA Fencing puts out a fantastic pamphlet for parents of new fencers. Find it here. 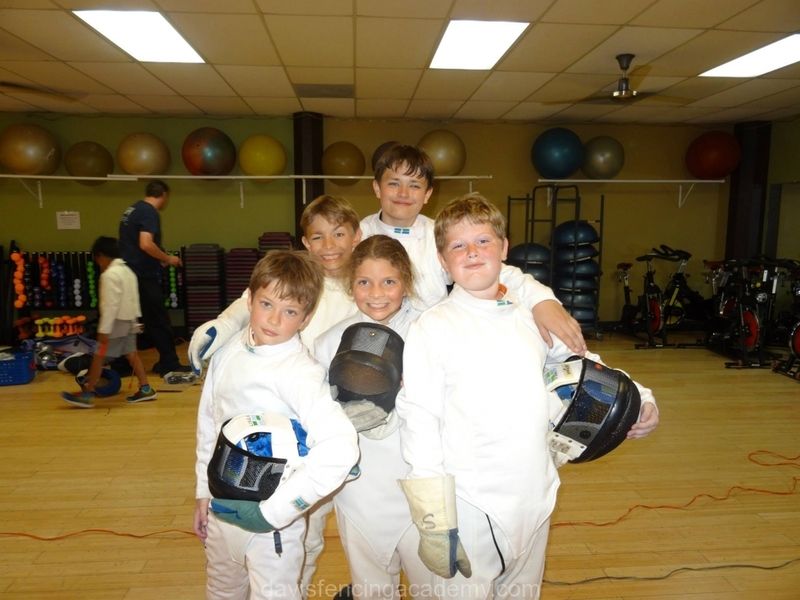 Foil, epee, and saber are the three weapons used in the sport of fencing. All have blunt points and edges. 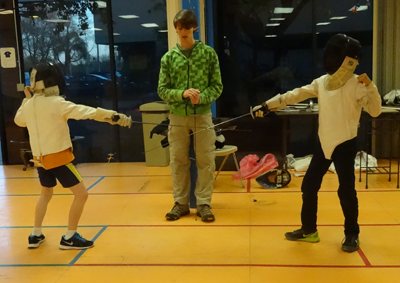 Foil and epee are point-thrusting weapons. Saber is a point-thrusting as well as a cutting weapon. The target areas differ for the three weapons, all three can be scored electronically. The foil has a flexible rectangular blade, approximately 35 inches in length, weighing less than one pound. Points are scored with the tip of the blade and must land within the torso of the body. The valid target area in foil is the torso, from the shoulders to the groin, front and back. It does not include the arms, neck, head and legs. The foil fencer’s uniform includes lame (pronounced “LUH-may”), which is a metallic vest that covers the valid target area, so that a valid touch will register on the scoring machine. A touch on the valid surface will register a colored light on the scoring machine. A touch on the non-valid surface will register a white light. The epee (pronounced “EPP-pay”), the descendant of the dueling sword, is similar in length to the foil, but is heavier, weighing approximately 27 ounces, with a larger guard (to protect the hand from a valid hit) and a much stiffer blade. Touches are scored only with the point of the blade. The entire body is the valid target area. Because of this, the epee fencer’s uniform does not include a lame. The saber is the modern version of the slashing cavalry sword, and is similar in length and weight to the foil. The major difference is that the saber is a thrusting weapon as well as a cutting weapon (use of the blade). The target area is from the bend of the hips (both front and back), to the top of the head, simulating the cavalry rider on a horse. 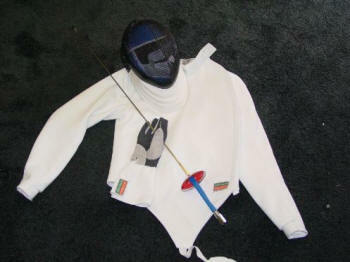 The saber fencer’s uniform includes a lame, which covers the target area to register a valid touch on the scoring machine. 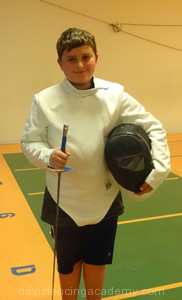 The mask is different from foil and epee, with a metallic covering since the head is valid target area. 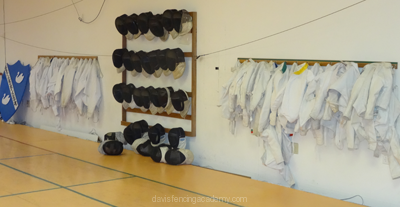 In fencing there are four basic pieces of equipment, the jacket, glove, mask and weapon. All of which are provided during classes. Additional equipment is recommended as skill increases. Maintain control of your weapon at all times. Use only those techniques which you have successfully practiced in lessons. Sword points stay down when inactive and/or off the floor. Follow additional safety rules as instructed by coaches. Remember: You are always, and only, responsible for your own actions!